So I asked the youth to consider their responses. Apparently, they’d all been significantly braver throughout their lives than I had. I recalled an experience that fits the Lord’s rebuke to a tee. 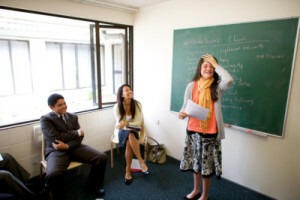 I’d been in the MTC (Missionary Training Center) only 12 days before flying to Scotland. Our two Scotland-bound districts were piloting a shorter MTC experience. I basically entered the MTC and left—one Sunday, one P-day (preparation day), one trip to the Provo temple as a district, and 12 days to bond with the best MTC companion ever! I found myself in my first area, the Isles of Lewis/Harris with Sister Kimberly Jensen. Before arriving in Scotland, I’d prayed to serve on this island! While crossing the channel on our long ferry ride, Sister Jensen told me all about the island. The city and surrounding villages shut down every Sunday—and by shut down, she meant literally. Shops closed. Public parks closed. For example, swings were chained to the swing set to prohibit usage. Even the golf course closed on Sunday, and everyone walked to church. It was awesome! I’d never lived in a community that felt so strongly about the Sabbath Day. But it also freaked me out, too. 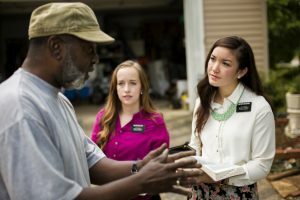 I felt really intimidated to go door to door sharing our gospel message when it felt like everyone was solidly committed to their own belief system. Our mission president, Joseph Fielding McConkie, set really high goals for the mission and established ways to accomplish those goals. One of those goals included talking to at least 200 people each week on the street. Later in cities like Edinburgh, I accomplished that goal easily. However, the total population of our area was smaller than the BYU population I’d left. I saw more sheep than people! We became really creative to meet our mission president’s goal. Another goal required us to tract for a certain number of hours each week. Tracting means to go door to door sharing a message about Jesus Christ. And it came to pass, that only days after I picked up my missionary name tag, Sister Jensen took me tracting. 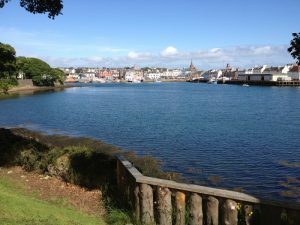 We went to a beautiful neighborhood in Stornoway, parked the car, said a prayer together, and stepped out into the early afternoon sunshine. Sister Jensen asked if I’d like to start us off. Actually, I did NOT want to EVER tract. I’d spent years of my childhood going door to door selling various things from vegetables to magazines and I absolutely hated it passionately. I wasn’t a salesman—did you want the thing or not was kind of how I felt internally. I hated facing rejection and unmet goals. I had a gigantic emotional barrier to tracting—complete and solid fear. But with some I am not well pleased, for they will not open their mouths, but they hide the talent which I have given unto them, because of the fear of man. 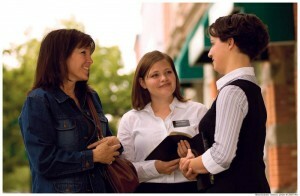 Sister Jensen patiently agreed to knock the doors and be our voice until I found courage. She knocked every single door on the right side of the street. No one invited us into their home, thus fulfilling every preconceived fear I possessed. At the end of the street, however, I realized I hadn’t died. I also started feeling guilty about not stepping up. I mean, I was a stepper-upper! Why was I so afraid?! So I agreed that I’d knock a door. But I shrunk when we actually got to a door. Sister Jensen patiently continued. As I sit here recalling this experience 26 years later, I’m shouting at my 21-year-old self—”Just get on with it!” Haha. But nevertheless, I didn’t. Halfway back down the left side of the street, we came to a home. It was mine. I felt it. I knew I could do it. I committed to take the door. I knocked. No one came to the door for pretty much eternity. As I prepared to leave the door, feeling pretty relieved that I didn’t have to say anything, it flew open. Standing in front of me was a 20s-something gal in workout clothes. She said something about not being able to come to the door right away. I said we’d like to share a message about Jesus Christ with her and her family. She said she’d love that and so would her family. She said that no one else was home at the time, but that they’d be home later. She gave us a time and asked us to come back by then. We joyfully agreed. We couldn’t believe it. I couldn’t believe it. Fears flew away. I continued knocking doors—alternating doors, of course. I still wasn’t crazy about it. We finished tracting after meeting our tracting hours goal. 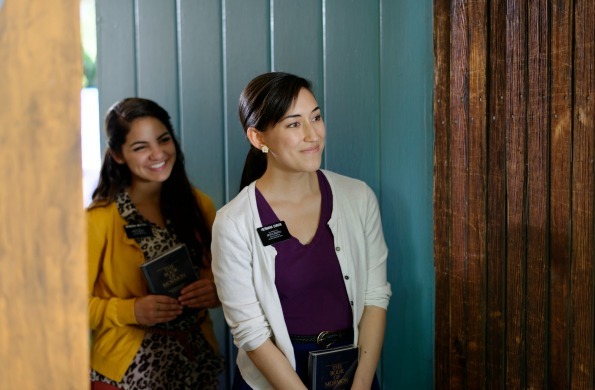 My first door was the only positive interaction we’d had during the entire afternoon of tracting. Jubilant about the prospect to teach, especially a family, we returned to the home at the appointed time. I excitedly knocked the door. A different woman answered the door. She had obviously just arrived home from work. She looked at us quizzically as I explained our interaction with the woman earlier in the day who invited us to return and share our message with the family. She quickly said no one by that name lived there. Sister Jensen and I looked at each other. We knew we were at the right house. Even now, I can clearly see the house and especially the doorway. It was the house. I described the woman. Sister Jensen confirmed. The lady again denied her existence at that house and hurriedly closed the door. We walked out to our car perplexed. But clearer than anything I can see, I knew that the Lord had provided that woman or angel or vision or whatever she was to overcome my fear. 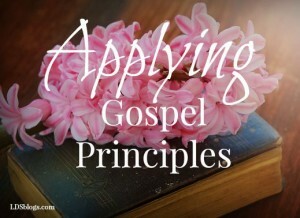 I had a fervent desire to proclaim His gospel but felt woefully inadequate. He provided a miracle for us on that street in Stornoway, Scotland. And I have NEVER forgotten it. Door after door, even through some residual nerves, I felt a strength grow. I became fearless as I endeavored to meet and exceed standards set for us and find ready people to teach. I experienced some things like being spit on and shouted at and having to run away from a door that did open. I also experienced some things like someone opening a door, being invited in, and testifying of Jesus Christ. I saw joy on their faces and hope in their eyes. And I knew, regardless of the door experience, that I was in the right place at the right time. That experience impacts me today as I’m still challenged to knock on doors physically as I minister or metaphorically as I serve in callings. And in this place let them lift up their voice and declare my word with loud voices, without wrath or doubting…. For I am able to make you holy, and your sins are forgiven you. Because I had faith in the Lord, He provided the sign I needed. Even though the situation didn’t unfold how I expected, I recognized the sign as a gift and manifestation of Heavenly Father’s love for me and an acknowledgment of the tremendous fear I felt. That sign, uniquely adapted to my need, strengthened my confidence and faith. And I knew forever after that every verse that describes declaring the word with any kind of loud voice was also a specially designed commandment just for me—because my loud voice was the talent I was hiding behind fear.